What good is a business solution that doesn’t address your specific need? Our approach at Visual Integrators is simple and focused on your individual business needs. What systems and software are you currently using? How many steps does it take you to input and process your data? What can we do to simplify things? 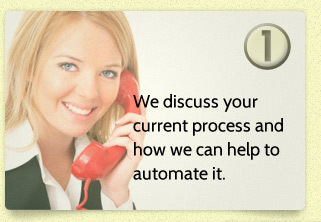 What can we automate for your business to save time? How can your methods and system be improved? When we fully understand our clients business and unique needs, we begin planning. 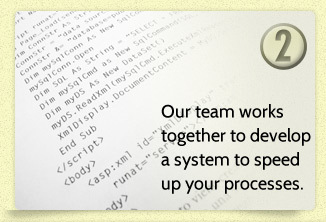 Our skilled team will design and develop a plan to create an efficient process for your business and software. Once the design phase has been completed and approved, we move forward with programming, automation, and systems integration. The new process and plans includes items such as custom inputs and reports, automated actions, software integration and custom programming. After your new technology solution has been put in place, it is time for action and testing. Any bugs that may arise will be quickly resolved so that your business can now focus on the more important things, like sales and production.